Ian Boden of The Shack restaurant in Staunton, Virginia, has received critical acclaim from publications as wide-ranging as The Wall Street Journal to Garden & Gun magazine. Following a successful career in New York City, Chef Boden returned to Virginia and the Shenandoah Valley to create a cuisine that is both forward-thinking and respectful of the past. The Shack was named one of the places for “Best Burgers in the South” by Garden & Gun magazine and was recognized by Southern Living magazine as one of the “Best New Restaurants.” Esquire magazine tapped The Shack for the “Best Dish” award for its 2014 restaurant issue. 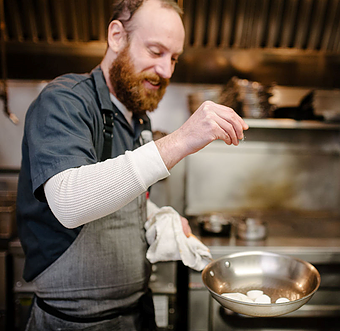 Most recently, Boden was nominated for 2017 “Best Chef Mid-Atlantic” by the James Beard Foundation, for the second time.